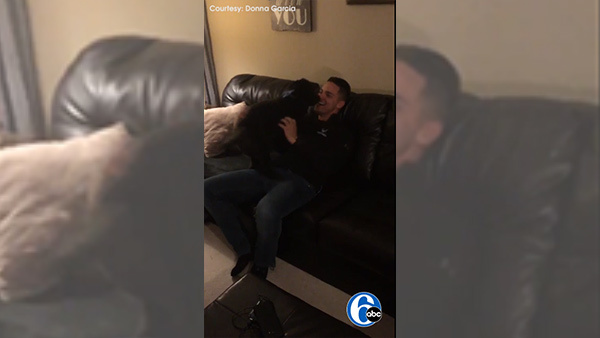 KING OF PRUSSIA, PA -- One loyal dog definitely got what he wanted for the holidays - his owner back home. Donna Garcia tells Action News her husband Rey, a member of the U.S. Air Force, has been away since August at the Sheppard Air Force Base in Texas. However, Rey was able to make it back home in time for Christmas. Donna says she picked Rey up at the airport on Friday, unbeknownst to their Goldendoodle Ben who had been missing his owner. When Donna took Ben out for a walk, Rey snuck into their King of Prussia home. "As soon as we got back from the walk, it's like he knew Rey was home, running around looking for him and eventually finding him," Donna said. Both, dog and human, picked up right where they left off and were happy to share the holidays together.